The Rogationists of the Heart of Jesus and the Daughters of the Divine Zeal. 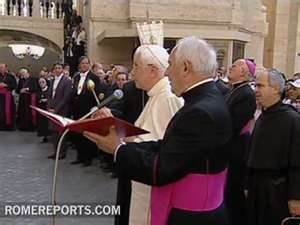 Wednesday, July 7, 2010 at the 10:15 hour in the Plaza of the Roman Protomartyrs, at the Arch of the Bells of St. Peter Basilica at the Vatican. The image of the Apostle of prayer for Vocations and Father of orphans and of the poor has been placed in the Center of Christianity. The event marks an important date for the history of Family of the Rogate. Welcome of Participants in Plaza of the Roman Protomartyrs. Greeting of Father Superior General. presided by His Eminence Most Reverend Cardinal Tarcisio Bertone, Secretary of State of His Holiness. O God, hope of the humble, refuge of the poor and father of orphans, who wanted to choose Saint Annibale Maria, priest, as distinguished apostle of prayer for vocations, through his intercession, send into your harvest worthy workers of the Gospel, and may it be that, moved by his same spirit of charity, we grow in love toward you and toward our neighbor. Through Christ our Lord. Amen. 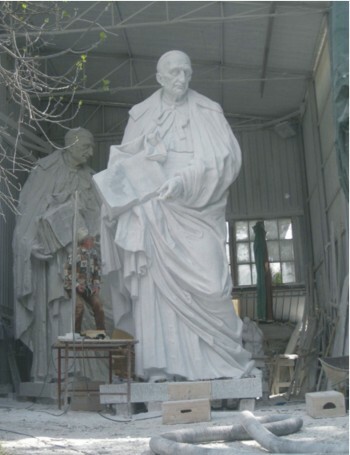 The statue, 5.30 meters high (17.5) and carved in a single block of marble from Carrara, is the work of the artist Giuseppe Ducrot. It was placed in the first niche at the Arch of Bells among the Saintly Founders of Religious Institutes, as perennial memory and witness of the charism of the Rogate.